A credit union’s operational strategy impacts productivity and efficiency metrics. It’s important for credit unions to strike the right balance between taking care of members and taking care of employees and the overall organization. The efficiency ratio helps credit unions monitor the relationship between operating revenue and overhead expenses by providing a measure of how much an institution spends to earn $1 of revenue. 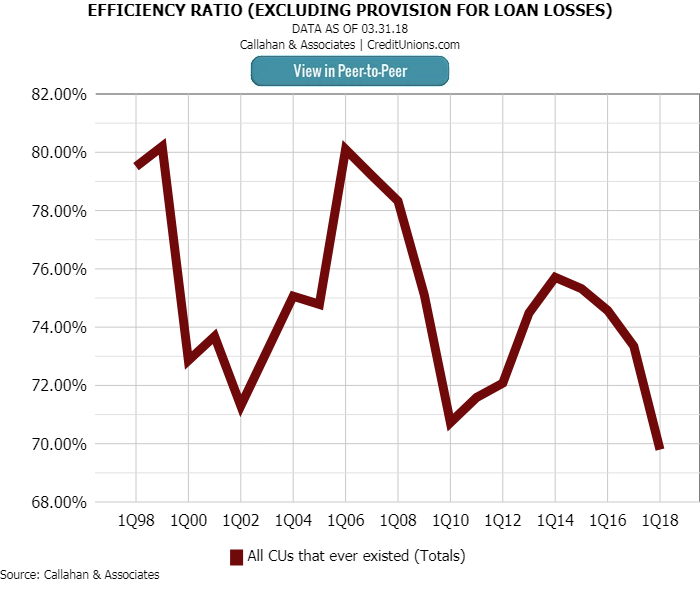 U.S. credit unions reported a first quarter low of 69.8% in the efficiency ratio (excluding provision for loan losses) as of March 31. The efficiency ratio for all U.S. credit unions dropped 3.6 percentage points to 69.8% as of March 31, 2018. This is a first quarter record. The efficiency ratio is calculated by dividing operating expenses by total income minus interest expense. Long-term expenses, such as office rental and loan servicing fees, can negatively impact the efficiency ratio. Short-term expenses, such as travel and conference expenses and miscellaneous operating expenses, can also throw off an efficiency ratio. A lower efficiency ratio indicates operating expenses are a smaller percentage of income, whereas a higher efficiency ratio suggests a credit union is losing a larger share of its income to overhead expenses. Generally, credit union leaders strive for lower ratios here. Regionally, credit unions in the Mid-Atlantic Region reported the lowest efficiency ratio — 62.0%. This was 7.8 percentage points lower than the national average and 11.1 percentage point lower than New England credit unions, which reported the highest average. 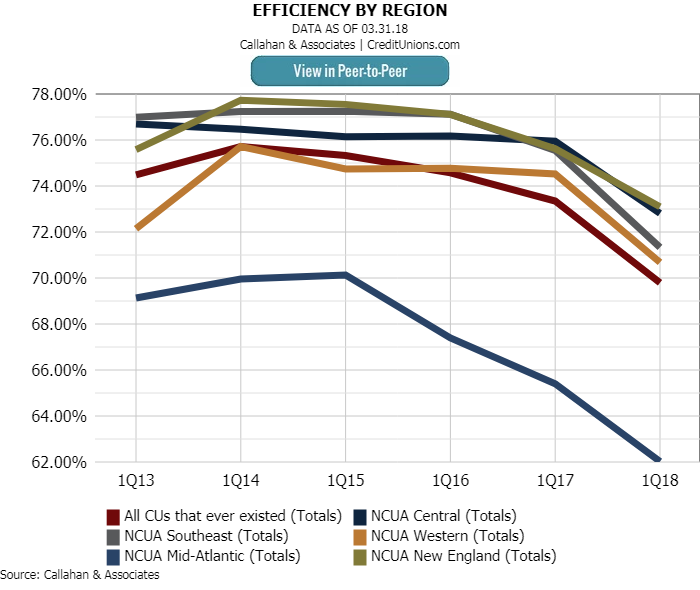 Credit unions in the Mid-Atlantic Region reported a noticeably lower efficiency ratio than credit unions in other regional. 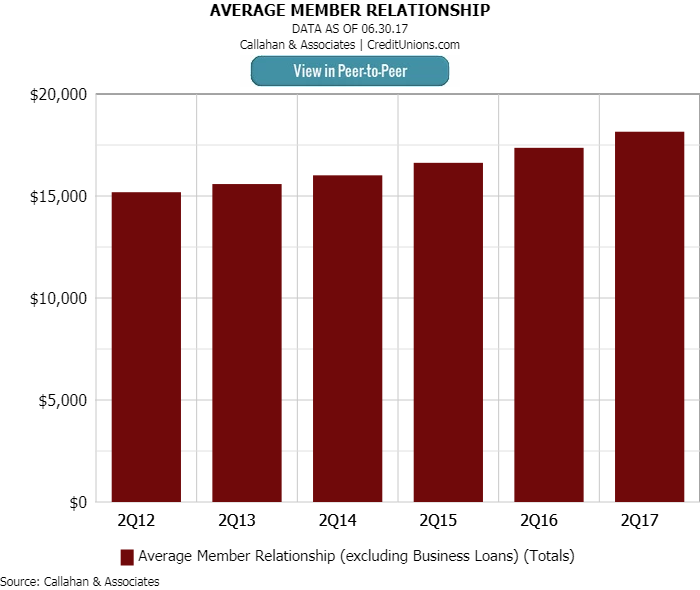 More than 4.5 million members have joined the credit union movement over the past year, and membership reached an all-time high of 114.1 million as of March 31. It is more important than ever that members fully use the range of products and services that cooperatives have to offer. The average member relationship tracks the total amount of share and loan balances (excluding member business and commercial loans) a member holds. As of March 31, that average for all credit unions reached $18,581 — a 2.8% improvement over one year ago and a 19.4% improvement over five years ago. The average member relationship for U.S. credit unions reached $18,151 as of the first quarter of 2018. That’s the highest amount ever recorded. But credit union membership isn’t the only roster to add numbers. The number of full-time equivalent employees at credit unions also grew, 4.1% year-over-year, to be exact. Salary and benefits per FTE, in turn, increased 4.83% to an all-time high of $76,345. More members coupled with tighter efficiency shows that credit unions are successfully managing funds to serve a growing base of members. How do your efficiency metrics stack up against peers?